The muscular looks of the 2019 Toyota Highlander separate it from the other mid-size SUVs in its class. The 2019 Highlander manages to blend aggressiveness and elegance, which many SUVs in its class try and fail to do. 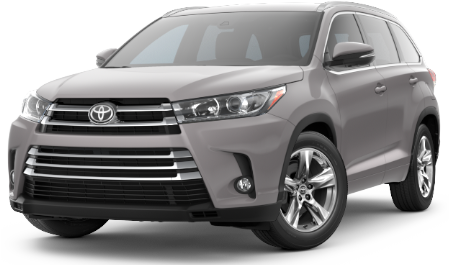 As striking as the new Toyota Highlander is, the exterior features may be even more impressive. The 2019 Highlander has standard 18-inch wheels that give the vehicle a sporty stance. The optional roof rails make it easy for motorists to tie down mountain bikes, kayaks and a wide variety of other gear. The available LED daytime running lights both look cool and make it easy for other drivers to spot your Toyota Highlander in low-visibility conditions. Take a look at the handsome 2019 Highlander. Come into the Rivertown Toyota dealership, Columbus, GA's local destination for family SUVs. Take your test drive today. Get more info on the safety features in the 2019 Highlander. Drop by Rivertown Toyota today and take a test drive. 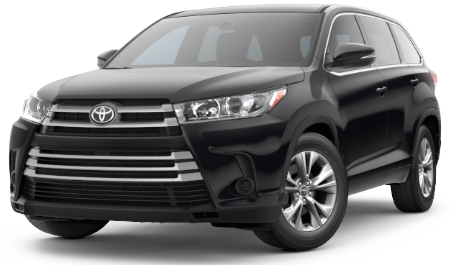 The 2019 Toyota Highlander offers a wide variety of powertrain and drivetrain options, so each and every driver can find a configuration that suits their driving style. The standard engine is a 2.7L 4-cylinder power unit that produces a peppy 185 horsepower. Adventurous drivers will naturally be drawn to the optional 3.5L V6 engine, which kicks out an impressive 295 horsepower. The 4-cylinder engine is paired with the standard 6-speed automatic transmission. The optional V6 engine is paired with the optional 8-speed automatic transmission that is capable of quick and sporty shifts. An optional CVT transmission offers seamless power delivery and optimal fuel economy. The standard front-wheel drive drivetrain enables a stable and safe driving experience. Drivers who like to go off-roading may want to specify the optional all-wheel drive, which greatly enhances traction in difficult conditions. If you've been looking through Columbus, GA car dealerships for a sporty and capable SUV, come into Rivertown Toyota today and test-drive the 2019 Highlander. The 2019 Toyota Highlander is perfect for families. It's spacious, comfortable and well-equipped with practical and luxurious features. The standard split-folding rear seats make it easy for drivers to simply flip down the seats and maximize cargo space in seconds. Of course, these seats can also be flipped up when occupants are ready to take their seats. The optional blue LED ambient lighting sets a relaxed atmosphere, even on stressful drives in thick traffic. The available triple-zone automatic climate control allows all of the occupants to be comfortable, which is not really possible with the dual-zone climate control systems that are common in competing mid-size SUVs. Experience the comfortable and stylish interior of the new Toyota Highlander. Come into our Columbus car dealership today for a test drive. The 2019 Toyota Highlander is perfect for families. It's spacious, comfortable and well-equipped with practical and luxurious features. The standard split-folding rear seats make it easy for drivers to The 2019 Toyota Highlander is well-equipped with useful and entertaining tech features. The technologies in the Toyota Highlander are also easy to use, which is more than can be said of the confusing tech in some competing mid-size SUVs. The standard 6-speaker audio system may be the tech feature that drivers use the most. It can play any genre of music with clarity and power and is generally considered to be one of the best standard sound systems in its class. The audio system and other functions can be controlled with the standard 6.1-inch touchscreen. The optional GPS navigation helps drivers get where they need to go in the Columbus area and beyond. The optional JBL® premium audio system uses 12 speakers to create an immersive listening experience. If you're in LaGrange, GA, Auburn-Opelika, AL or elsewhere in the Columbus area, swing by the Rivertown Toyota dealership in Columbus to try out the tech features in the 2019 Highlander. Schedule your test drive through our website today.